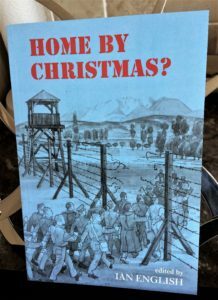 To commemorate the 74th anniversary in September 2017 of the Italian Armistice, the book Home by Christmas?, one of the most important PoW texts and always much in demand, has been reprinted. First published in 1997 by Ian English, himself a PoW, and revised by his children Christine, John and Diana 20 years on, the book recounts the remarkable adventures experienced by some of the 600 prisoners of war who marched out of camp PG49 at Fontanellato after the Armistice on September 8th 1943. It is an invaluable resource and several of those who told their stories were early supporters of MSMT. The book also tells of the extraordinary bravery and sacrifices of the Italian people without whose assistance the ex-PoWs would have been forced to give themselves up. As with the first edition, MSMT will receive proceeds from sales of the book which is priced at £12.95. Contact Christine English at homebychristmas43@gmail.com for further details.